Paper cone with treated cloth surround. Open back and stamped basket. 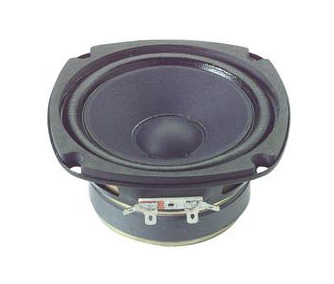 Perfect for bookshelf type speakers and car stereo installations. * Power handling: 20 watts RMS/30 watts max * Voice coil diameter: 1" * Impedance: 8 ohms * Frequency response: 70-15,000 Hz * Magnet weight: 9.3 oz. * Fs: 70 Hz * SPL: 90 dB 1W/1m * Vas: .31 cu. ft. * Xmax: 1.1mm * Qms: 1.40 * Qes: .47 * Qts: .35 * Net weight: 2 lbs. * Manufacturer model number: A11EC80-02F * Dimensions: Overall Diameter: 4-1/2", Cutout Diameter: 4-1/8", Mounting Depth: 2-3/8", Magnet Diameter: 3-1/8", Magnet Height: 1".